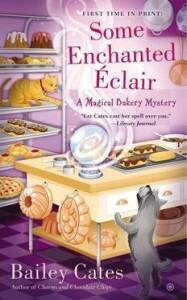 Ready to hear who won the signed copy of a signed copy of SOME ENCHANTED ECLAIR by Bailey Cates? Cheers to… CAROL M! 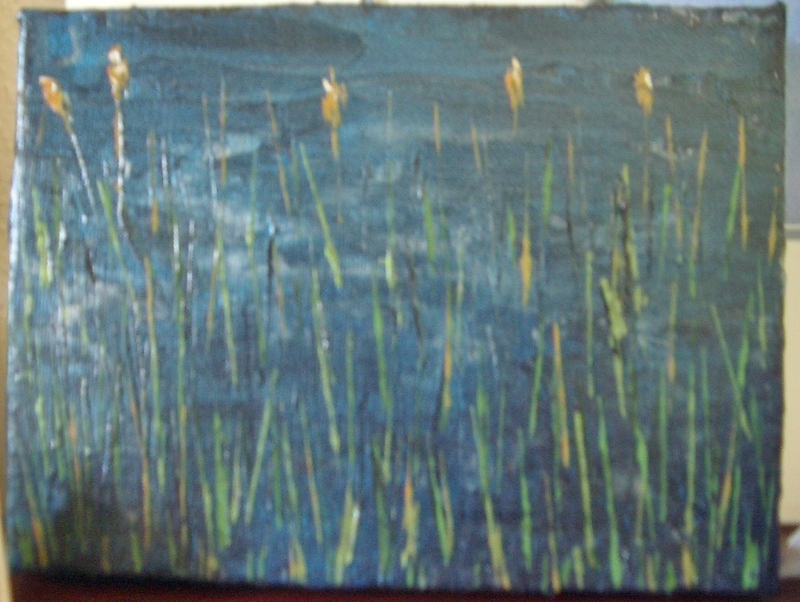 Please send your mailing address to me at leslie (at) lesliebudewitz (dot) com by June 2 to claim your prize. Or else my supervisor will stare at me until I pick another winner! 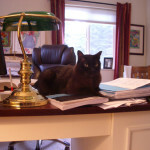 Photo: Ruff the Cat, aka the Supervisor, the model for Mr. Sandburg in my Food Lovers’ Village Mysteries. The past two weeks, we’ve been celebrating the upcoming release of my third Food Lovers’ Village mystery, BUTTER OFF DEAD, with a glimpse of some of your favorite authors’ prized collections. 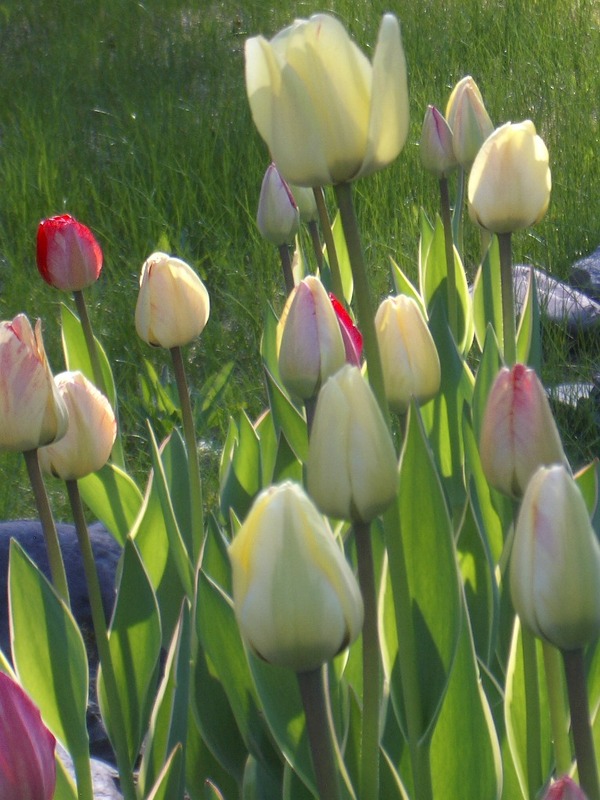 Today—mine, and a few musings. I thought I’d escaped the collector gene. 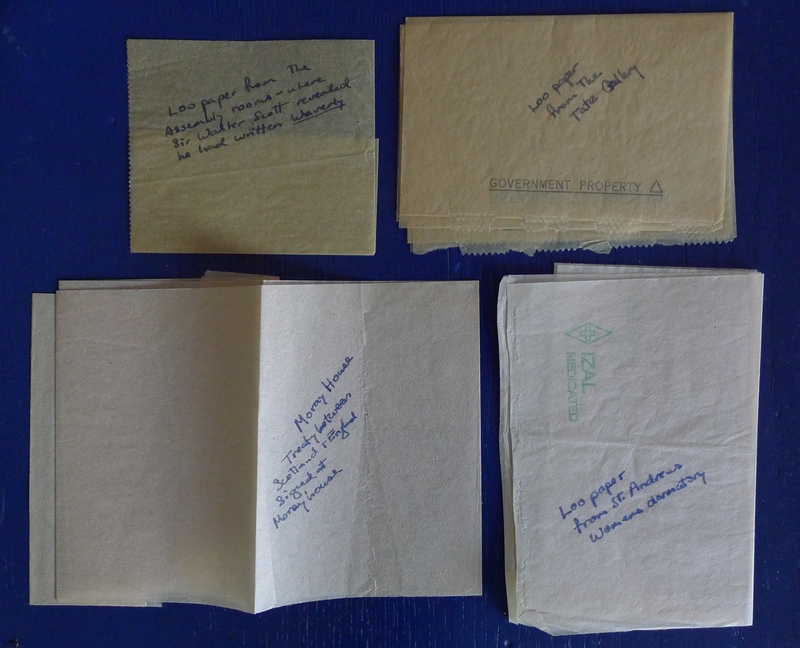 My father’s baseball cards and memorabilia, his stamps and first-day covers, his postcards, the cameras and carved wooden boxes he brought back from his captivity in Switzerland during the war—all intrigued me, but I never felt a need to follow suit. One Barbie doll was enough, and even that had been a gift. The trolls? Fun, until I was done with them. My brother got the gene—and the collections, and he’s added to them. My sister-in-law has her fabrics and her cat figurines and her pottery, my mother her angels, my husband his swords and Huichol Indian beadwork. Even when I wrote BUTTER OFF DEAD and found myself musing about when a collection becomes an obsession, and when an obsession becomes deadly, I didn’t think of myself as a collector. I don’t stop at garage sales and rarely scrounge through antique or junk shops. 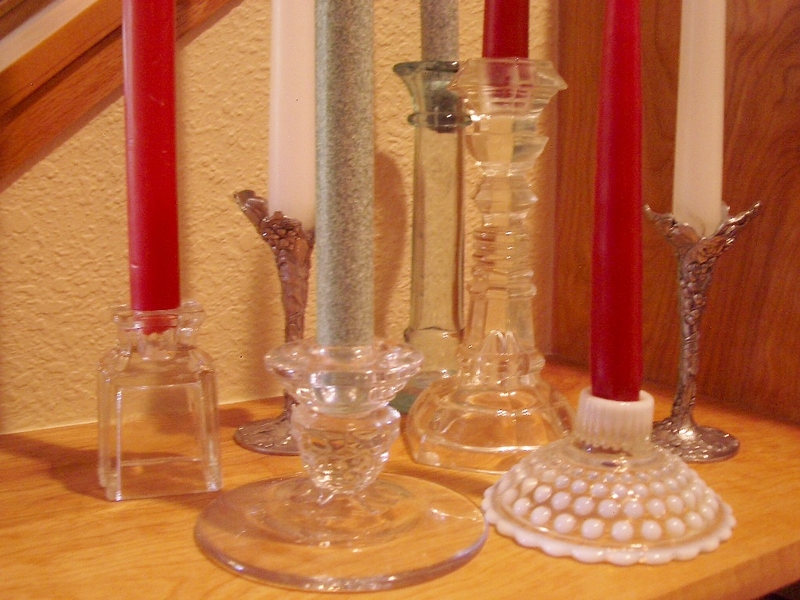 The umpteen glass candlesticks? An accident that began with two Fostoria Americana singles I found at an antiques show in Seattle, when I went with a friend. I’d always loved the pattern and snatched them up, inspired by my mother’s doubles. I bought other shapes and styles; she searched out a few more, and a friend joined in the fun. The first antique bottle surfaced when I was digging a hole for a yew at a farmhouse I once owned. 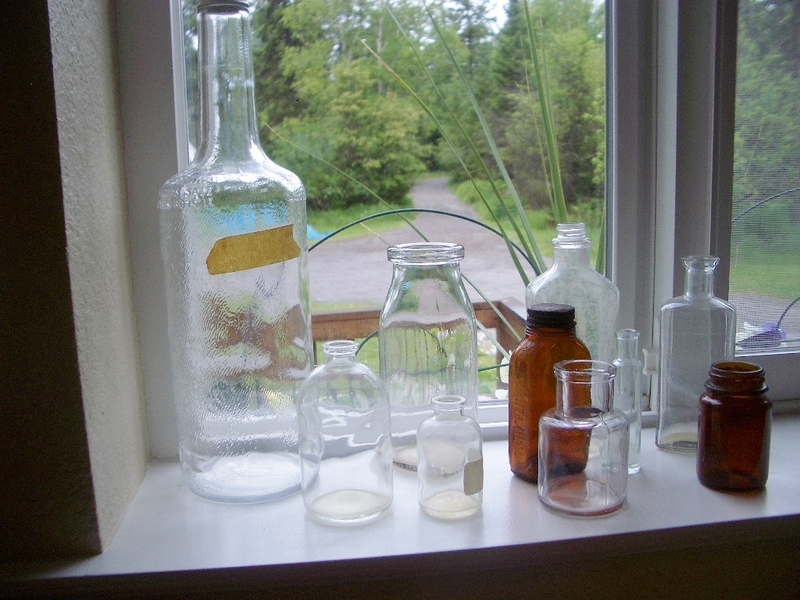 A second hole yielded a second bottle—I’d probably found the homesteader’s garbage heap. Now gardener friends share their finds, and a few others have come to me as well—bottles that once held ink, cream, patent medicines, and who knows what else. 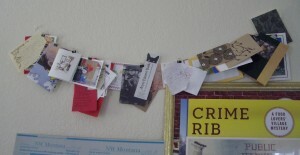 What about the notes readers have sent me and the bookmarks from stores where I’ve given talks or readings? Collection, or inspiration? Both. 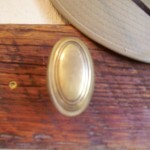 My first brass doorknob came from that same rural Montana farmhouse. They’re hard to reuse in modern doors, so I kept my treasured few in an old cigar box (and no, that’s not another collection!) until we planned a major remodel. 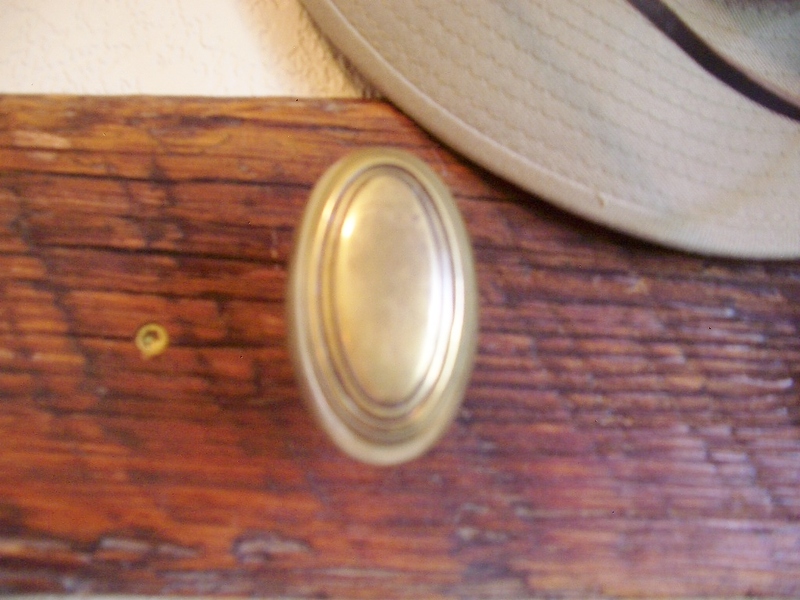 A friend who’d salvaged a few knobs in his days as a builder rounded out the collection, and we created this coat rack inside our back door. 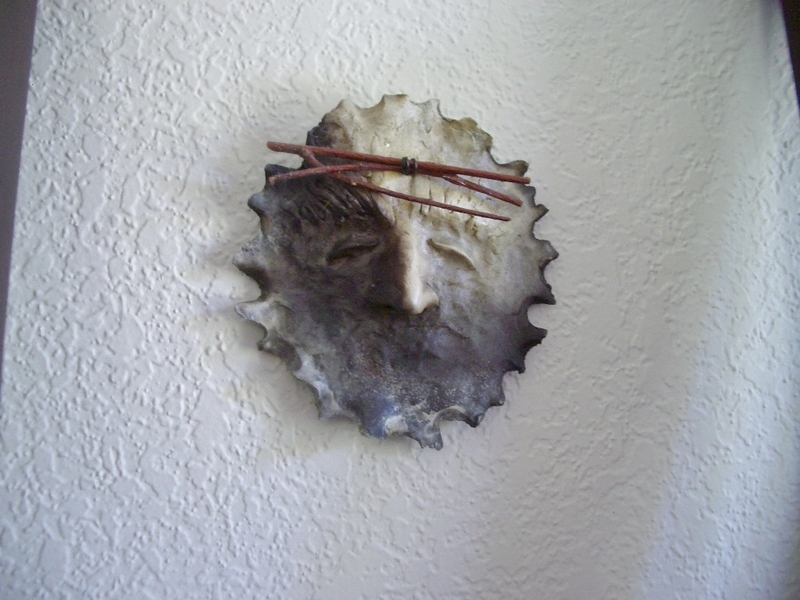 One more: Since my unpublished days, I’ve bought myself a piece by a local Montana artist as a prize for finishing a book. (Still haven’t bought the prize for BUTTER; must go shopping!) Here are a few faves: an iridescent cattail grove by Christine Vandeberg (you’ll meet her namesake in BUTTER); a woodblock print called Three Chickadees by Sarah Angst; and a tree spirit by Lana O’Myer. Over the last two weeks, as we’ve shared our collections, it’s been clear that readers and writers simply must have our books. One reader said books aren’t collections, because collections are luxuries and books are necessities. Mine, like most of yours, I suspect, were bought to be read, not to complete a set or fulfill a search. Maybe that makes me less a collector and more a reader. I can live with that! Another reader called our collections part of our identity, and there’s a lot of truth to that. Even the authors who initially told me they didn’t collect anything quickly realized otherwise. Some collections, it turns out, are accidental. Others are inherited. Some are nurtured; some the owners wish had never gotten started! They are, ultimately, symbols of connection—to a time or a person long gone. 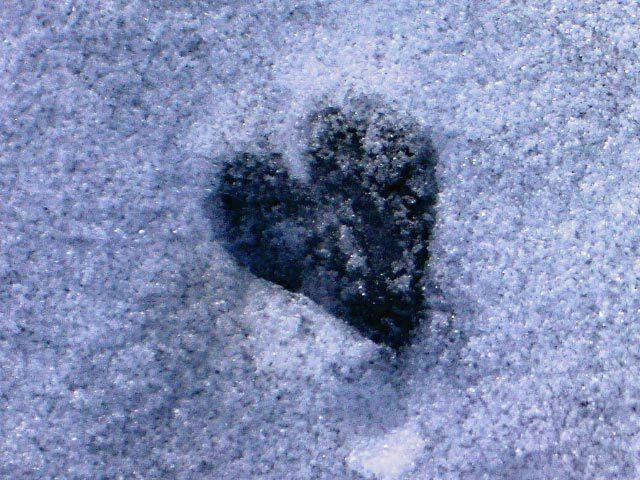 To a place we loved, to a feeling they bring. To friends, to lovers, to family. To pieces of ourselves. 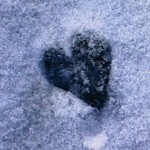 What better symbols of all that than hearts and light? Leave a comment on my Facebook page or blog by midnight, Tuesday, June 2, for a chance to win a SIGNED bound galley of BUTTER OFF DEAD or a copy of THE COZY COOKBOOK, telling me which book you’d like to win. 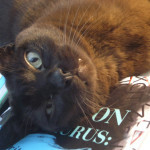 Ruff the Cat will choose a winner at random—check back Wednesday to see who sent him the tastiest catnip bribe! Who among us hasn’t wanted to spend the day with Sophie Winston and eat and drink at her table, with all that luscious glassware and china — and that beautiful food? And the garden. Catch up with Krista on her website, Facebook, or Twitter. 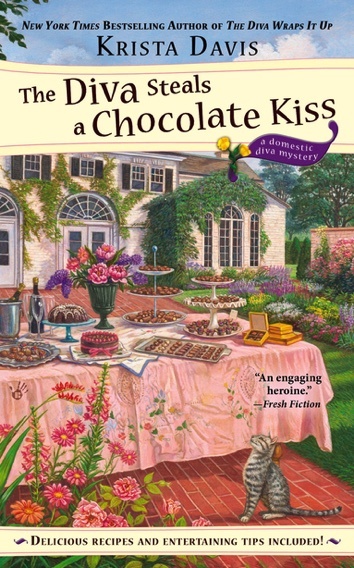 Ready to hear who won the signed copy of THE DIVA STEALS A CHOCOLATE KISS? Cheers to… DAWN SMEDLEY! Please send your mailing address to me at leslie (at) lesliebudewitz (dot) com by June 1 to claim your prize. Or else my supervisor will stare at me until I pick another winner! We’re celebrating the upcoming release of my third Food Lovers’ Village mystery, BUTTER OFF DEAD (July 7—save the suspense and pre-order it now! 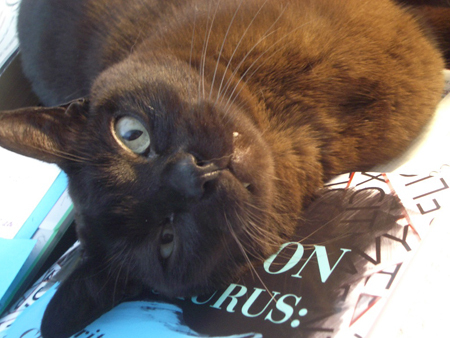 ), with a glimpse of some of your favorite authors’ prized collections. 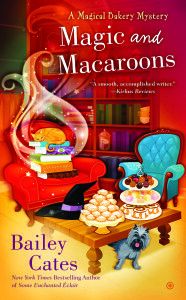 Today, Bailey Cates, aka Cricket McRae, shares a very book-ish collection that started long before she became a published author. 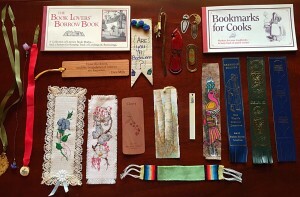 “When Leslie asked if I collected anything, I immediately thought of my bookmarks. 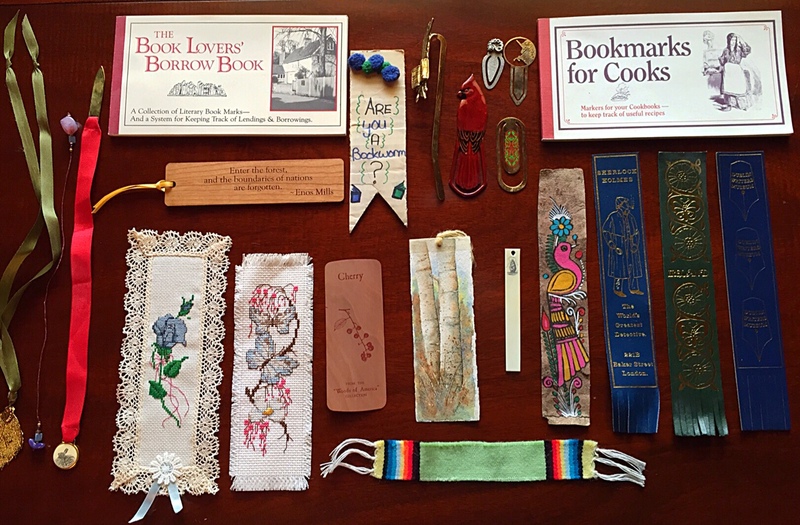 Of course, I have craft “stashes” — of yarn and fabric, of herbs and essential oils and soap molds — but the only thing I really collect is bookmarks. I started when I was quite young. I loved reading, they were small and easy to pack (and we moved a lot), and they were cheap (often free). Now, forty years later, I have hundreds of bookmarks, perhaps even thousands. 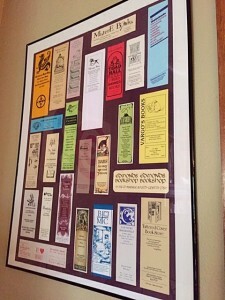 This is a framed set of bookmarks from well-loved bookstores. Unfortunately, many of them are out of business now, but at least these live on to decorate my office wall. And this a sampling of just a few of the others. There are the gifts of cross-stitch, watercolor, and a pom-pom bookworm on cardboard. The leather ones on the right are part of a mini-collection from my travels in Britain, where they seemed to be ubiquitous souvenirs. Shown is one from Ireland, one from the Dublin Writers Museum, and another from the Sherlock Holmes museum. 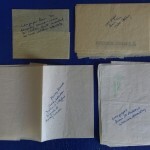 The books of bookmarks crack me up — but admittedly are a good way to share recipes or have people return borrowed books. Beside the Bookmarks for Cooks is a laser-cut unicorn from my very early days of collecting. Yes, I was a girl who loved unicorns. And there in the middle is a tiny ship etched on a recycled ivory piano key — one of my very favorites. Leave a comment on my Facebook page or blog for a chance to win a SIGNED copy of SOME ENCHANTED ECLAIR, fourth in the Magical Bakery mysteries from Berkley Prime Crime/Penguin Random House. 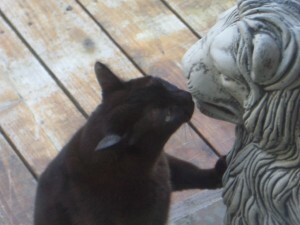 Ruff the Cat will choose a winner at random—check back in the morning to find out! And watch for the next in Molly MacRae’s Haunted Yarn Shop series, KNOT THE USUAL SUSPECTS, in September—pre-order it now! Connect with Molly and read more about her books on her website or on Facebook. Ready to hear who won the signed copy of SPINNING IN HER GRAVE? Cheers to… BARBARA HAWK! 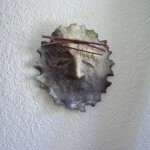 Please send your mailing address to me at leslie (at) lesliebudewitz (dot) com by May 31 to claim your prize. Or else my supervisor will stare at me until I pick another winner! 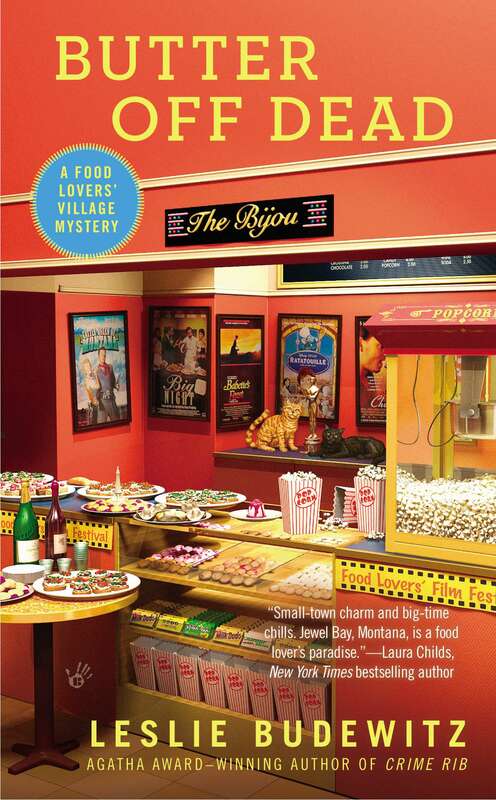 We’re celebrating the upcoming release of my third Food Lovers’ Village mystery, BUTTER OFF DEAD (July 7—save the suspense and pre-order it now!) with a glimpse of some of your favorite authors’ prized collections. 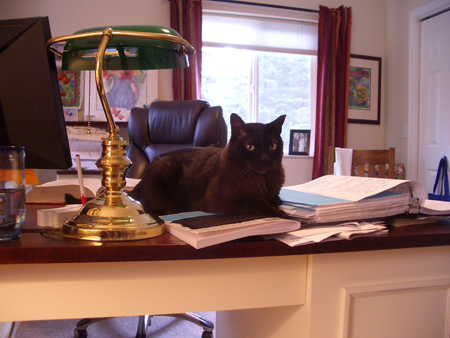 Today, a peek behind the scenes with Krista Davis, author of the Paws and Claws Mysteries and the Domestic Diva Mysteries. “When Leslie asked what I collect, I couldn’t think of a thing. 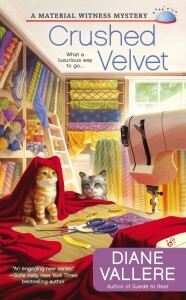 But then I remembered Sophie Winston, the protagonist in my Domestic Diva Mysteries. She’s always collecting china. 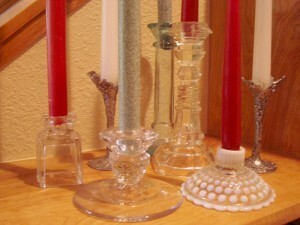 I confess, I have a weakness for crystal and china, and I indulge my desires through Sophie, who has a vast collection. But let’s be clear. I’m not a snob. My fondness extends to glassware and ceramics, too. If I had the money and the space, I would be one of those crazy people with special dishes for every holiday, including Easter and Halloween! Okay, so I do have Christmas china. Hmm, I haven’t acquired that beautiful Waterford stemware with snowflakes on it yet . . . 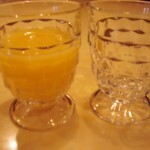 In the photo, the fun flowered glasses are from Pier 1. 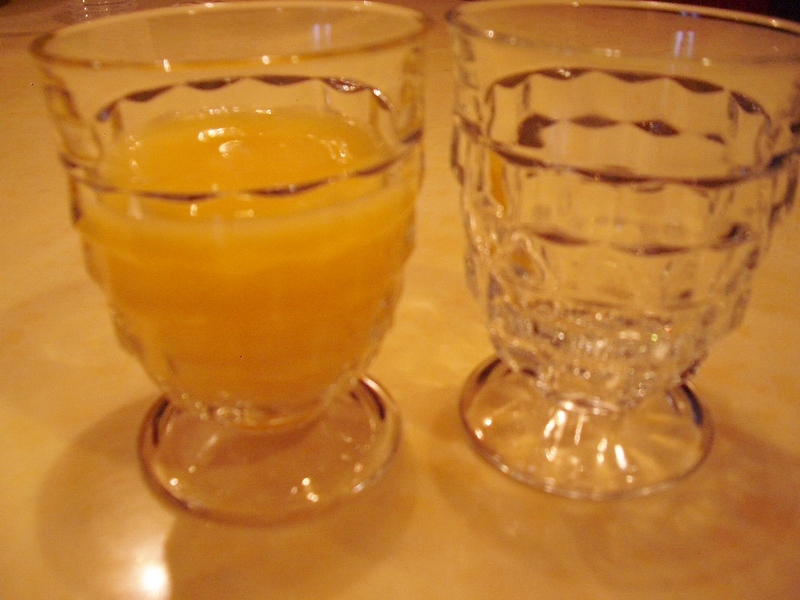 The gold-rimmed schnapps glasses were bought on a trip to Europe eons ago. The red plates are among my favorites. Who doesn’t love all American Fiestaware? 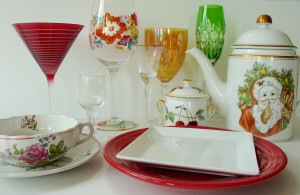 It’s so cheerful for breakfast or a meal on the patio. My latest obsession are those cute little square plates from Macy’s. So clean and modern. Perfect for appetizers and tiny desserts. The amber glasses make an appearance every Thanksgiving. And doesn’t everyone need some champagne glasses for special celebrations? 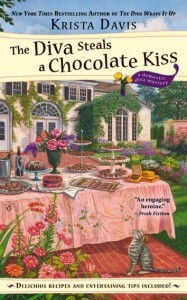 To win a copy of signed copy of THE DIVA STEALS A CHOCOLATE KISS, leave a comment on my Facebook Author page or blog. Ruff the Cat will choose a winner at random—check back in the morning to find out! 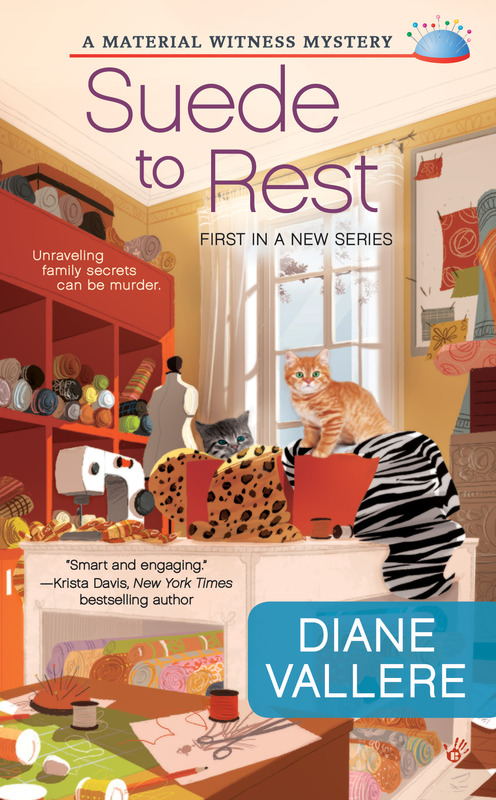 Shoes, clues, and clothes—Poly Monroe follows them right into trouble, and sews up a killer in Diane Vallere’s Material Witness mysteries. 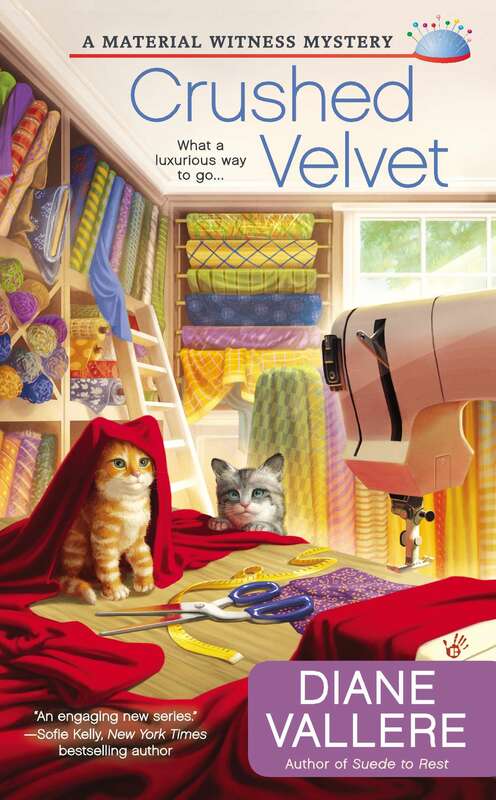 SUEDE TO REST (2014) will be followed by CRUSHED VELVET (August 2015, available for pre-order now). 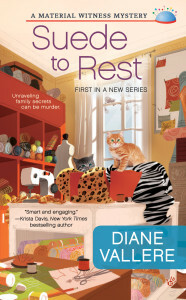 Connect with Diane on her website, on Facebook, or Twitter. Ready to hear who won? Cheers to… MARILYN WATSON! 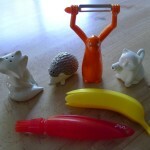 Please send your mailing address to me at leslie (at) lesliebudewitz (dot) com by May 30 to claim your prize. Or else my supervisor will stare at me until I pick another winner! 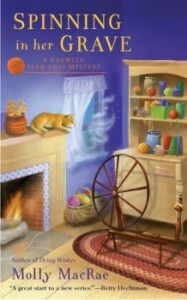 Today, a pair of collections from Molly MacRae, author of the Haunted Yarn Shop Mysteries. KNOT THE USUAL SUSPECTS, #5 in the series, will be out in September—beat the rush and pre-order it now! “I don’t think of myself as a collector, so imagine my surprise when I realized I have several small collections. How fun is that? 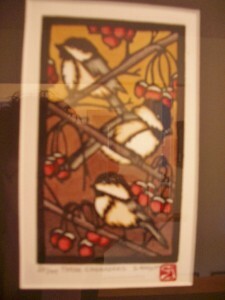 Here are pictures of three of them. The first is an inadvertent collection of odd and old cookbooks, including a government pamphlet called How to Cook Clams. People keep giving me things like that. 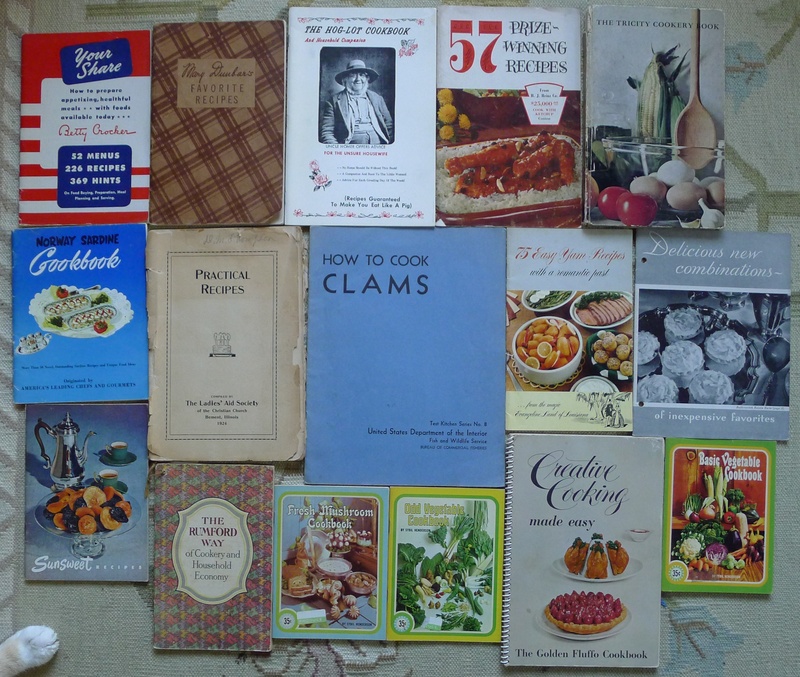 The picture of this collection could be called “Cookbooks with Incipient Cat” (notice the advancing paw in the lower left corner). 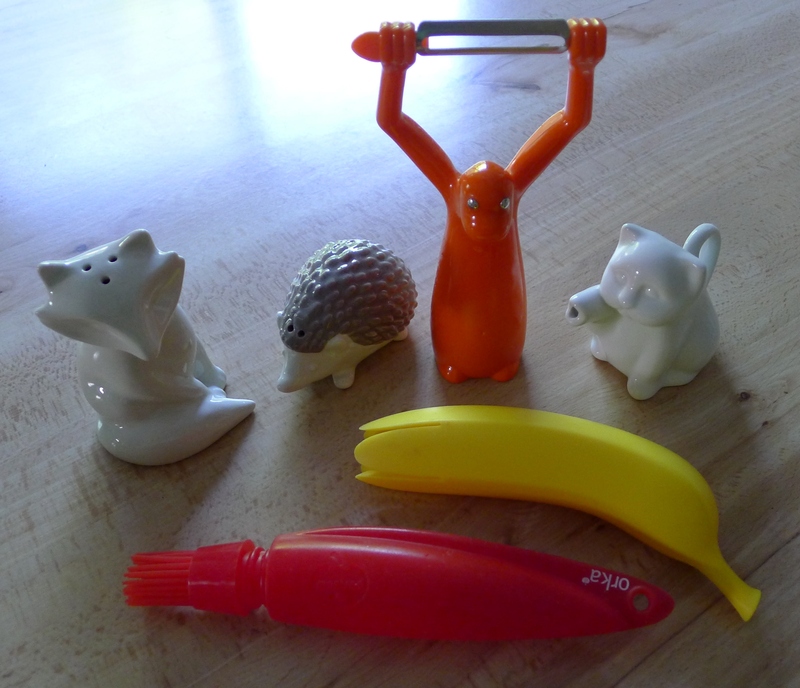 The second collection can be called “Kitchen Flora and Fauna.” Here we have a fox and hedgehog salt and pepper, a cat creamer, a monkey peeler, a squid baster/brush, and a banana pot handle – all attractive and useful. Leave a comment on my Facebook page or blog, for a chance to win a copy of SPINNING IN HER GRAVE, #3 in the series. Ruff the Cat will choose a winner at random—check back in the morning to find out! 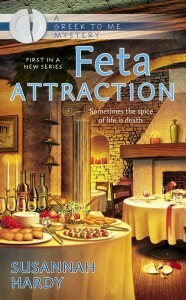 Ready to hear who won the signed copy of FETA ATTRACTION by Susannah Hardy? Cheers to…BARBARA HAWK! BUTTER OFF DEAD, July 2015 (available for pre-order now!) And hear Erin tell you a little about the Food Lovers’ Film Festival today at Killer Characters!